As long as you book direct on emirates' website - the cashback would pay out - unless ofcourse you are saying that prices on comparison website are less by 100 or more as compared to emirates' own website? Doh. Quite witty. Went straight over my head! My experience of Emirates was perfect. Couldnt do more for you inflight. However this was nearly 17 years ago!!! Be a shame if its gone downhill in this time. Re. Suitcase issue, wouldnt that be the airport/luggage handlers who may be at fault as opposed to the airline? This happened to me too, but i believe its the airport staff in dubai! Nicked my brandnew lacoste shirt! Big headed, terrible customer service, to busy buying aircraft not paying much attension to customer service. i used kayak last month and paid 525 to fly with emirates to bali. same flight and dates costs 606 as a sale price. In addition to the above remarks about the service unwinding when things go wrong, I have to add that things are more likely to go wrong when transfering through DXB in the winter, rain and fog can conspire to make an already badly designed and over crowded airport almost unuseable. Direct flights not involving the middle east are always preferable IMHO. However if you do have to fly with Emirates, once you're off the ground the're pretty good. Been checking prices with Emirates for Manchester to Bangkok for a few weeks now for end of April and the 'sale' price is actually £1 more than it was last week. Went last year similar time for £400. For what it's worth the flights themselves with Emirates are usually ok but the transfer in Dubai can be a nightmare, they have got too big too quick so often the plane stops at a remote stand and you then have to take a bus and a train to the terminal once you have landed and then another bus to get the connection. As mentioned Emirates ground staff can very rude and have no customer service skills whatsoever. I have found the same before, but when tried to actually book them the prices goes up before let's you pay. Always ended up booking direct with Emirates in the end. Clicking the link I see the msg; Important: The promotional code you entered is incorrect. Please check and try again. My sister has used her Amex card to book a couple of flights as well now and says thank you on the hot deal. Thanks for this link,ended up using O2 priority in the end,saving more than £150 for flights to NZ. help, it only knocked off £12??? I tried to book Dubai trip and know it is 5%. but I was expecting at least £40 off. Does anyone know if I can use the code again as it did not complete? and also does it knock more off at the end? You need to have an o2 sim to get o2 priority. 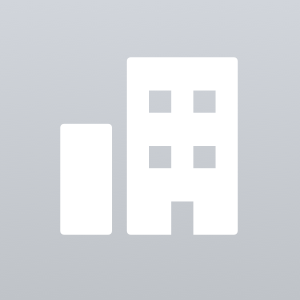 You can download the app. for air plane tickets ..
Hope someone can find something...for me it is 200 quid more expensive than other airlines...oh well. really!!! What is the link for??? I'm a bit confused as to why you've assumed that I scheduled the flight. Besides, this was the most expensive time of the year. You've got to do what it takes to get the price down. If that means waiting around for a couple of hours then so be it. Please let me direct you to my previous comment. "people who don't have a clue need not comment." Got Singapore Airlines LHR - Brisbane via Singapore and returned Sydney- Singapore (2.5 day Singapore Stopover) then Singapore -LHR for £800 last December. That also included BA flights to and from NCL with no stops of more than three hours. Went through Trailfinders who got access to the flights before they were released to the public. Cant wait to go back, loved Sydney, Brisbane was great , not that keen on Singapore. Good price, anyone who disagrees clearly hasn't been abroad to Australia before. Went to aus last Xmas with emirates which was over 500 each way and had to stop in Dubai for 3 days and then go to Brunei and wait around for hours for the flight. Not only is this cheaper but its a much quicker flight overall, people who don't have a clue need not comment. Emirataes Alirlines service standards have dropped, they are too busy trying to domainate the skys but forgetting high levels of service. Its very hard to find a good deal on Emirates now a days as the have grown by leaps n bound in recent few years, and quality of service has declined at the same rate as well. And they are not intrested in your complaint either.They have kind of monoply on Glasgow airport routes so price difference is always huge aswell. So its cold from me. Have travelled regularly with Emirates to KL over last few years. Were doing return flight to Gatwick for £492 in January. Anything up to £530 is ok. MAS often around the £870 mark but £620 at the min as they are expected to announce bankruptcy shortly. If I lived in London I would fly MAS as Emirates have gone downhill over the last few years especially after they joined up with Quantas. Stolen isn't really accurate given that the inhabitants are actually from the countries you mentioned and the food is a fusion of many different flavours. Malaysian food is actually one of the hardest to sum up and describe in a short sentence. However, apart from say the food, shopping, some of the other cultural bits (melacca is one of the better tourist destinations), and the beaches, there isn't all that much to Malaysia. Perhaps pirated goods since they're incredibly easy to obtain there.. This. Its also probably fair to say that people who are travelling business on long haul are unlikely to be browsing HUKD so that they can save a £1 on bottled water at asda. This works by enticing people who are not using their own money to book flights, flying on business trips they get a little back hander on the quiet. Booked a flight to Dubai for £388 for November after seeing this deal. Now gone up to £541. Thanks. Heat from me. Why does it show as expired? Yes, thats what it says but not really tried other cards to see if they go through. YMMV. so you have to have an Amex card right ? Offer Terms and Conditions American Express Cardmembers will receive 10% discount on Economy and Business Class full fares and 5% discount on promotional, tactical fares. 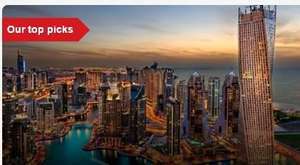 Cardmember must visit emirates.com/amex and pay on their American Express Card. Book from 20 January to 15 February 2014. **Travel from 20 January to 15 March 2014 (outbound) from the following countries: US, Canada, United Kingdom, Switzerland, Italy, Austria, Russia, France, Czech, Netherlands, Spain, Portugal, Sweden, Australia, Korea, Malaysia, Thailand and Taiwan, Saudi Arabia, Qatar, South Africa and Turkey. Travel outbound from 10 February to 15 March 2014 (outbound) from China, Hong Kong and Singapore. Discount only applies on the base fare and on flights that terminate in Dubai. Discount does not apply to First Class Cabin nor to the lowest starting fares in Economy and Business Class in the markets mentioned above. Taxes, fees and charges are also excluded. All bookings are subject to seat availability at the time of booking. Flight restrictions apply on select routes. *Reduced fares include the V and X class (in Economy cabin) and P class (in Business Cabin) where applicable. 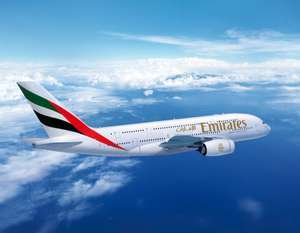 For full Terms and Conditions of Emirates Airline flights, please visit http://www.emirates.com/uk/english/sitetools/terms_and_conditions.aspx The promoter is: Emirates, a corporation established by Dubai Ruler's Decree No. 2 of 1985 (as amended) having its principal office at Emirates Group Headquarters, Airport Road, PO Box 686, Dubai, United Arab Emirates ("Emirates"). Not sure on the Auckland flights, but when I was booking mine to Dubai and selected the show results as cheapest fares, some flight combinations did not come up as an option. By selecting the to search by schedule I then got all the flight time options and was able to select times and flights that did not even show before, even though they were still coming up at a similar price. Worth a try if you haven't already. these fares look good, but some flights to Auckland have a delay of over 21 hours..yikes..
Is this code safe to use as it knocks about £600 off a set of business class flights to Sydney? Will check in ask for evidence? Duh! Just read the info on the website. You can convert Amex points to Emirates rewards, I thought it was the other way round. Ended up having a look at the Amex cards while I was there. The annual fee is quite steep (£450) on the Platinum though I suspect if you've got that card then it should be affordable. Any downsides to owning an Amex? Is it accepted everywhere? Are the charges higher such as booking flights or cinema tickets etc? I have travelled with Qatar before. They are the worst airlines I have travelled with. The food is lousy. I'm about to board Emirates from Perth back to london. I think they're certainly one of the better airlines! Food is nothing special, awful coming out of Dubai! emirates is nice love the food. 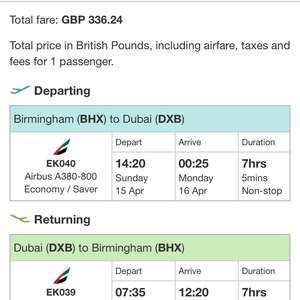 Just booked MAN-HKT 31/1/14-31/3/14 £527 with Qatar Just checked Emirates same dates £977 I'm definitely not fooled…. There's no way anyone could see all Singapore has to offer in a day - not even merely the touristy stuff - it just can't be done. I agree about HK though - equally full of history, culture and amazing sights to see and experience. Perhaps, and it would not be your fault, your judgement of Singapore may be biased due to a realised expectation of a white-washed, clinically clean, culture-less, futuristic, perfectly running, harmonious society that the ruling Lee family have been so desperate to portray to the world for the past 40 odd years. This is entirely fictional, of course. Peel back the layers just a little bit and you'll find a land rich in culture with a fascinating, vibrant and turbulent history (though of course the Lee regime try their darnedest to eradicate most and manipulate the rest of that), that equals and even surpasses HK in many aspects. It's hard though, to open a book that's been so tightly glued shut, after having a good few pages torn out. We done all the sightseeing in a day, rather dull compared to Hong Kong- where I'd just been! I wouldn't recommend anyone go ! Night Safari? Singapore flyer? china town? going to the marina bay sands at the top? Lots to do! I wanna go to both ;) either of you paying? hehe Emirates fares are not that amazing but the flight is! Yeah HUKD aren't all that honest about it (unlike moneysavingexper) but they have to play the capitalist game too. But quidco guys so don't click the link here. Looking now. Welcome to HUKD. How do you think the site keeps costs covered, and then makes money? why does the link have an affiliate link? someone surely trying to make money out of peoples click? ?